The US and China have issued a joint statement confirming that both countries will sign the Paris Climate Agreement next month. Both say they will take all the "domestic steps" necessary to join the agreement as soon as possible. They are encouraging other countries to sign the document at UN headquarters in April. At least 55 countries representing 55% of emissions have to sign to bring it into force. This is the third joint statement in the past two years from the world's two biggest emitters on the question of climate change. Back in November 2014 the two leaders outlined their plans to limit carbon emissions, a move that inspired other nations to follow suit. At the Paris talks late last year, the presence and support of President Xi Jinping and President Barack Obama were critical factors in securing a comprehensive, longer term deal that agreed to keep global temperatures well below 2 degrees C.
But while more than 190 countries agreed to the document in the French capital, the formal process of signing and entering into force begins next month at UN headquarters in New York. UN Secretary General Ban Ki-moon has invited world leaders to the ceremony and says he expects about 120 countries to turn up and sign on 22 April. The hope is that with the big two, representing almost 40% of global emissions, now committed to the agreement, it will be much easier to get other nations to sign as well. If the 55% or 55-country target is exceeded, then the agreement will become operational this year. "The joint statement that the United States and China will sign and join the Paris Agreement as early as possible this year sends an extremely powerful signal," said David Waskow from environmental campaigners World Resources Institute. 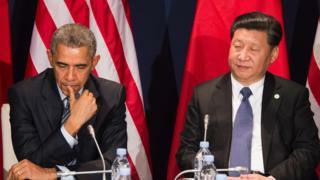 "This joint statement cements the role that climate plays in the US-China relationship. It shows the confidence that both countries have in each other's ability to deliver on their climate commitments." President Obama's domestic plans to curb carbon emissions ran into serious difficulties earlier this year when the Supreme Court issued a stay on the Clean Power Plan, designed to cut emissions by 32% by 2030 and significantly boost renewable energy. But in their joint statement, the US and Chinese leaders re-emphasise their commitments to taking the necessary "domestic steps in order to join the agreement as early as possible this year". White House officials have repeatedly expressed confidence that the Clean Power Plan will be implemented despite the legal hold-up. The joint statement from the leaders also details the extra steps they now want to take on climate change. According to the document, they are both committed to tackling the question of airline emissions this year, something that many critics said was a key missing element from the Paris agreement.